No, this post is not an attempt to personally disparage the folks running North Carolina government. Rather it is an attempt to conjure up an image that captures the impact of the decisions that state leaders have been inflicting of late on their brethren and sistren at the local level. As some readers will recall, The Three Stooges were an outlandish and slapstick comedy trio that had a long run in the middle part of the last century. 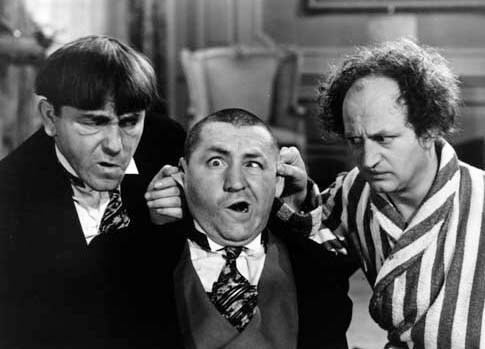 In one of the trio’s recurring bits, one Stooge (usually Moe – pictured on the left) would slap or punch the second Stooge, who would then, in turn punch the third member of the group. The third and most hapless Stooge would then turn beside him and find that he only had thin air to punch. Sadly, this comedy bit pretty well captures the essence of what’s going on in North Carolina government right now: Whether it’s the McCrory-Pope team or the General Assembly that starts the punching, the ones left flailing at thin air are local governments. For the latest classic example, check out the bill under consideration in the state Senate during the waning days of the 2014 session that would hamstring local governments in their ability to raise local sales taxes for important needs. While Senators sought to alter some of the the impacts of the bill last evening, it still promises to have a deleterious impact — especially on big counties like Wake and Mecklenburg. And, of course, this comes on the heels of several previous haymakers in which state leaders have slashed state support for locals. The bottom line is that the overarching policy of the current conservative state leadership when it comes to local government is this: We’re all for local control that’s closest to the voters — except when we’re not (i.e. any time anyone at the local level even thinks about doing something — like raising taxes to provide essential public services — with which we disagree). SLAP!!! Previous PostFive reasons why adjournment (and a state budget) appear unlikely this weekNext Post Breaking: Healthcare subsidies on the ropes? Excellent analogy; well, some would say the 3 Stooges should be offended. I wouldn’t argue the point. No, these are radicals. Again from the dictionary: “Carried to the utmost limit; restrained….favoring or effecting revolutionary changes…One who advocates political and social revolution.” Sounds like Berger & Tillis and others to me. I can”t wait to vote them out. When I think of the 3 stooges, I can’t help but think of Obama, Biden, and Eric Holder. You can pretty easily figure out who plays each character.